France has been developing geothermal energy for many years, especially after the two oil crises of the 1970s. Many direct uses of geothermal energy operations have been realized since 1961, with most of the wells drilled at the beginning of the 1980s, in the Paris sedimentary basin and in Aquitaine. Renewed interest in these operations has emerged since 2007. The only French geothermal power plant was installed in Bouillante (Guadeloupe, French West indies) in 1986. A second unit at Bouillante began in 2004. Several surface exploration studies and exploration drilling have been conducted in the French West Indies and in La Reunion Island. Development of ground-source heat pumps is more recent. A new policy has been implemented since 2005, mainly due to the ‘Grenelle de l’environnement’ process which aimed to redefine the French policy for sustainable development and which was based on discussions with various stakeholders including: industry, environmental associations, local authorities, state services, unions, and geothermal experts. 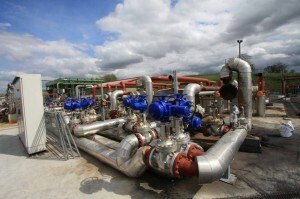 This ambitious policy suggests new development of every type of geothermal energy in France. Geothermal heat is expected to increase by a factor of 5 between 2006 and 2020, and 80 MWe of geothermal electricity is expected to be installed in the overseas department by 2020.